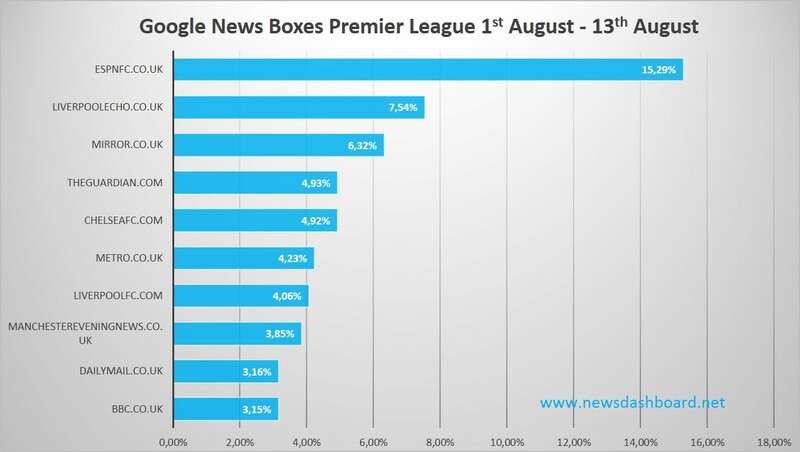 Premier League has started: Which news publisher is reaching for the cup? The Premier League has started last weekend (8th of August). Finally, British and international football fans can support their favourite team again. There are several new celebrities in the Premier League this season: for example Bastian Schweinsteiger, who came from Bayern München; or Memphis Depay – the Dutch national player, who formerly played in Eindhoven. Others left England and the Premier League – one of them is Steven Gerrard, who always played in Liverpool. Of course, the media covers the transfers, the football matches of the first match day, the players, coaches and more related topics. But which news site or website performed best in Google News Boxes? We collected a specific set of keywords including all football clubs of the Premier League, their coaches, and a selection of popular players. Then we analysed, which publishers ranked successfully in the Google News Boxes over the last three weeks (1st of August till 13th of August). As you can see in the chart, one site is ranking first by far. The sports and football site espnfc.co.uk has a visibility of more than 15 percent of all Google News Boxes of our football keyword set. Other UK players, who are usually on top in Google News Boxes regarding ALL topics and keywords in Google News, are visibly behind: theguardian.com only has a percentage of 4.9 percent. Usually, between 20 and 30 percent of all articles in Google News Boxes belong to theguardian.com. It is similar for bbc.co.uk. In our analysis of the football keyword set, the broadcaster ranks 10th – usually, the BBC is number one concerning the Google News Boxes. This result is a bit astonishing at first sight, even though these two players are more “general” players, which cover all topics not just sports. A closer view shows differences. Espnfc.co.uk reached this result with mainly the news boxes to five keywords and has so a “very focussed ranking profile” whereas theguardian.com and mirror.co.uk have a broader range of keywords in the analysis they rank to but with lower figures. On the other hand, we found that in this specific case, there are some regional publisher websites, which were able to get much traffic and to rank in many One Boxes – for example liverpoolecho.co.uk (7.54 percent) or manchestereveningnews.co.uk (3,85 percent). Those are obviously newspapers of cities with successful and big football clubs such as Liverpool F.C., and Manchester United as well as Manchester City. There is another thing that strikes: there are also two websites of football clubs which often rank in Google One Boxes: chelseafc.com and liverpoolfc.com. The supporters of the clubs can also find articles and news about their favourite team there – it seems that Google trusts them as well as news sites, although they just give information about one topic – their specific football club.